Does the US Have Significant Leverage over Khartoum? In early June, violence began in Southern Kordofan State (which lies inside North Sudan, on the border with South Sudan) when the government in Khartoum started to disarm residents who had fought on the side of the Sudan People’s Liberation Army (SPLA) during the 1983-2005 civil war. With peacekeepers from the United Nations Mission in Sudan (UNMIS) unable to halt the violence, and with Khartoum pressing for UNMIS to end its mandate once Southern independence happens on July 9, many fear an escalation of conflict. The crisis in Southern Kordofan – which observers like UN Dispatch’s Mark Leon Golberg are calling “ethnic cleansing” – raises the issue, once again, of how much leverage the US has over the regime in Khartoum. Former US Ambassador to Nigeria John Campbell adds that with some of the final status issues between North and South Sudan unresolved, and with voices in Khartoum pressing Bashir to act tougher toward the South, the US has less room to influence Bashir or move forward on matters like removing Sudan from the list of state sponsors of terrorism. In addition to applying pressure from afar, the US is also working on the ground to promote peace in Sudan, with Special Envoy Princeton Lyman heading to Sudan this month. Still, the limited nature of the “carrots and sticks” strategy, as the Carnegie Endowment’s Marina Ottaway told AFP, will constrain what diplomats can offer or threaten. Lyman himself portrayed US influence over Sudan as limited in this recent interview with NPR. If the US can’t strong-arm Khartoum, can anyone? Hamilton says that multilateral institutions and China have greater leverage over Khartoum than the US. China will soon have an opportunity to exercise its influence if it wants: Sudanese President Omar al Bashir is scheduled to visit China and meet with senior officials from June 27-30. 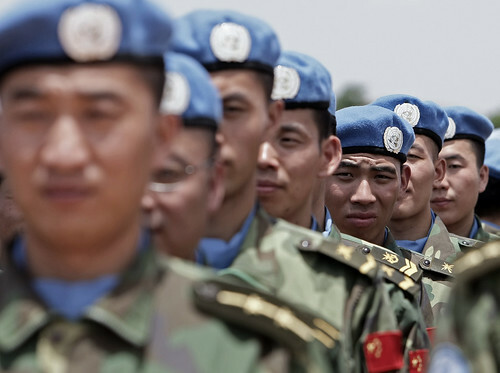 China has a stated interest in peace for Sudan. After all, with 75% of Sudan’s oil in the South, China has incentives to maintain strong relations with both North and South – and to prevent them, if possible, from engaging in conflict that would disrupt oil exports. Washington, which recognizes the possibility for Chinese influence over Khartoum, greeted news of Bashir’s trip with the hope that China would assist in peacemaking. The limits in Washington’s leverage over Khartoum throw into relief some of the ongoing changes in Africa’s political landscape. I do not believe that Washington could ever consistently dictate outcomes in Africa – certainly there were African regimes during the Cold War who stayed in power despite American opposition to them, and African rebel movements that defied America’s friends – but the end of the Cold War, and the rise of China, have altered America’s role in African politics. Rather than leaning on client states and building relationships predicated on ideological sympatico, over the last two decades Washington has pursued an ad hoc policy toward Africa, experimenting with disengagement (Somalia after Black Hawk Down), noninterference (Rwanda in 1994), militarization (such as AFRICOM and smaller military programs in Africa), pro-reform rhetoric (such as Secretary of State Hillary Clinton has used in her trips to the continent), and intensive diplomatic engagement (as in Sudan). The inconsistencies in this overall strategy, combined with the rise of other actors, has given African regimes greater freedom to maneuver than they had during the Cold War. This helps explain why Khartoum, a regime that signed a US-brokered agreement partly in hopes of achieving better relations with the US, feels able to act contrary to the expressed wishes of the American president. After all, if Bashir doesn’t like what he hears from Washington he can, and will, go and see what they say in Beijing. This entry was posted in Sudan and tagged Abyei, Barack Obama, China, Omar al-Bashir, Southern Kordofan, Sudan by Alex Thurston. Bookmark the permalink. The Chinese half of this equation is presumably true. Beyond African policy, inconsistencies within U.S. policy at the global level may be the ultimate culprit. At the same time, North Sudan was bound to do what it wanted, relatively speaking. You make the vital point, however, that Sudan must be internationalized rather than isolated. So does this reality necessitate a joint U.S.-Chinese policy, or will each country act unilaterally in competition? I think that hits pretty close to the mark. Seems to me that part of the reason for US inconsistencies (or maybe Western in general) is our own schizophrenia in our approach: on one hand we want to strengthen African governments’ institutions – for the sake of security / stability / democracy – but on the other, we do have the incentive to keep governments reliant on us, which keeps us able to use that Cold War-style leverage we don’t seem to want to give up. I also have to wonder whether African strongmen, who seem to believe they’ll be in power forever, feel they can afford to wait out US term-limited presidents – and perhaps even have more respect for, say, Chinese leaders style of governing.